Showcasing its strong holdings of Kyoto Rimpa (Rinpa) school artwork, the Hosomi Museum is staging an exhibition: ‘Rimpa of Kyoto: The Enjoyment of Beauty’. On entering the exhibition, we are greeted by a pair of six-fold screens bearing the seal of Innen. Flowering plants of the four seasons are neatly spread over an expansive and beautifully patinated gold leaf ground. The brushwork is fluid, though it is more an encyclopaedic rendering of flowering plants than an involved and dynamic work of art. Across from the screens are two stars of the show: Sotatsu’s ‘Two Puppies’ and ‘Plum Tree’. The charm of the puppies lies in their simplicity. Bold contrasts and intertwined forms create an intimate and perpetual sense of duality. Sotatsu’s auspicious plum tree, with its strong and consistent lines, alludes to vibrancy in one’s later years. The gnarled trunk is secondary to the new growth and blossoms. ‘Autumn Plants’ by Kitagawa Sosetsu is a lovely free-flowing painting. Using a boneless technique, he has created a beautifully intertwined and believable nature scene. It is presented as a pair of two-fold screens, though they are more likely the four surviving panels of a six-fold screen. 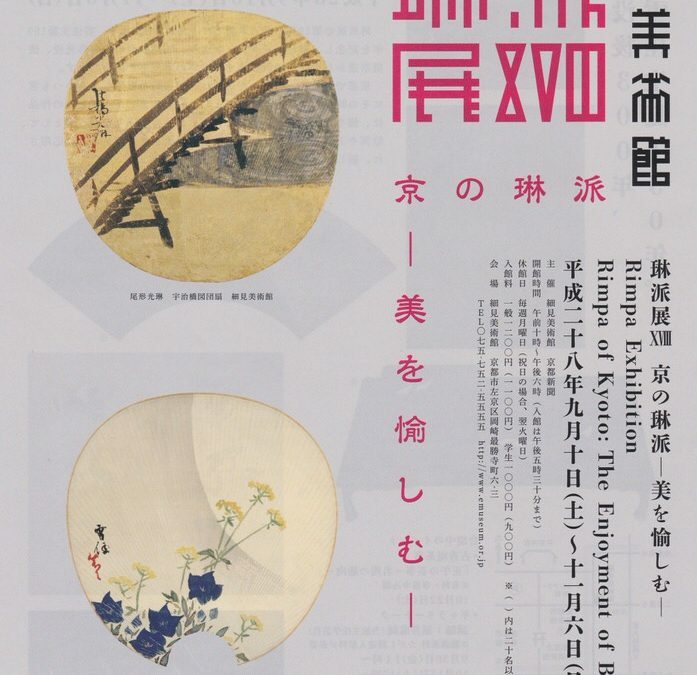 Korin is admirably represented by a couple of well-known, small-scale works, one of which is shown on the exhibition flyer. Even so, it is an unassuming, ink-brushed painting of bamboo which seems to capture the hearts of the viewers. Nakamura Hochu, an Osaka artist, is strongly represented. Two intriguing scroll paintings of a conventional nature presumably date to the earlier part of his career. One is a sumptuous painting of morning glories; the other, a deer barking at the moon. This leads to several smaller format paintings such as fans, books, and shikishi cards. Here, we see his renowned bold designs, with a strong emphasis on colouring and the tarashikomi technique. Watanabe Shiko is similarly represented by a beautiful yet formal work, ‘Autumn Moon and Bamboo Blind’. This is displayed next to a two-fold screen titled ‘White Elephant’. The contrast could not be starker. His elephant appears to be inspired by Sotatsu’s famous ‘White Elephant’ sliding doors at Yogen’in temple, Kyoto. Works by the 20th-century master of Rinpa design, Kamisaki Sekka, complete the show. His works are organised and precise, with an unerring crispness and clarity.